Today we are pleased to welcome back guest author James Brookes. Federal soldiers often mused over the origins of the rations issued to them. One supplement, “furnished in lieu of potatoes, rice and peas or beans”, particularly perplexed them. [i] It came dried in cakes, blocks and sheets, swelled to an astounding size when boiled, and gave a dubious impression that led to curiosity towards its contents. Few enjoyed the substitute, many despised it. 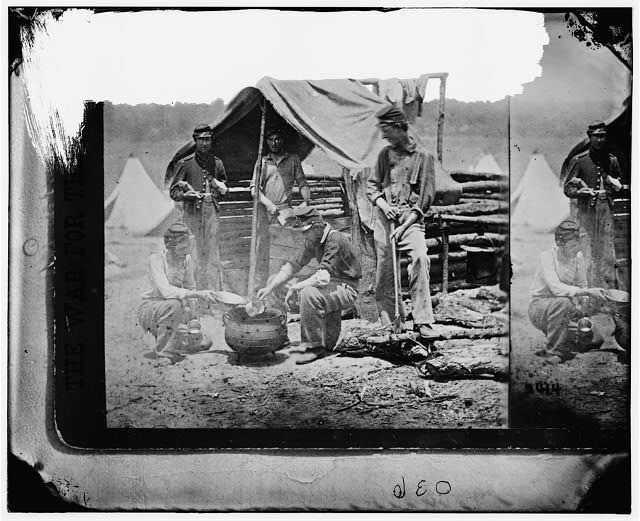 The unpopular ration was a reflection of the modernisation of warfare and the attempts by the Union Army to ensure the enlisted man’s preservation of health in an extensive, efficient, and inexpensive manner. In 1852 the U.S. Navy’s Bureau of Provisions and Clothing reported a newspaper notice announcing an important discovery exhibited by Peyrusset, Moller & Co., of Paris at the 1851 meeting of the Horticultural Society in London. The exhibit involved “various dried vegetables, such as peas, haricot beans, Brussels sprouts, carrots, turnips,” that had been dried by a process consisting of dividing the vegetables “into pieces, placing them in an apparatus into which dried air is driven, until they have parted with all the water, and have become perfectly dry.”[ii] The Navy shortly conducted various experiments on these desiccated vegetables in order to verify their suitability for confronting the issue of scurvy aboard ships. There were also those who seemed surprisingly fond of the dubious ration. Major Abner R. Small of the 16th Maine Volunteers observed that when cooked this “substitute for food” reminded him of “a dirty brook with all the dead leaves floating around promiscuously”, but noted that “We ate it, and we liked it, too.”[x] Alfred Bellard of the 5th New Jersey also seemed content with this lot: “desacated vegetables were all kinds of green stuf pressed into a square cake… it would swell out and make a very nice soup.”[xi] Soldiers suffered nutritional deficiencies as a result of consuming army rations, especially when on the march when their fare was further limited. It is likely that these men were merely glad to have, in at least some form, vegetables and the benefits they provided. 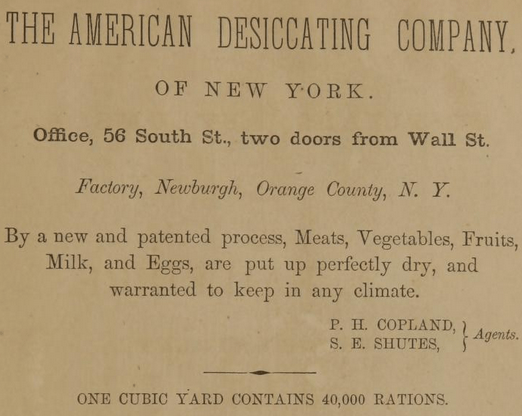 The dried vegetable compound was seemingly unpopular amongst enlisted men and officers, but it reflected the Union Army’s attempt to utilise what it deemed an advanced method of supplying nutrition efficiently to the soldiers. Billings deemed it more suitable for “Southern swine than Northern soldiers”, but the supply of fresh vegetables often led to wasted funds and food loss from decomposition. [xv] Though detested, desiccated vegetables provided a transportable and long-life substitute source for nutrition and vitamins in a conflict in which the U.S. grappled with the great task of mobilising and feeding over 2 million citizen-soldiers. This entry was posted in Armies, Common Soldier and tagged 13th Massachusetts, 16th Maine Infantry, 3rd Iowa Cavalry, 5th New Jersey, Abner Small, American Desiccating Company of New York, Fort Laramie, Randolph Marcy, U.S. Commissary Department, U.S. Navy Bureau of Provisions and Clothing. Bookmark the permalink.